Last night a nice couple came to take away the kids to their new home. The two goatlings were picked up and placed in the arms of a grandmother in the back seat of the two-door pickup truck. The older woman had raised goats in the past and when handed the little babes she glowed like a new mother. She knew how to hold a goat and I was happy to see them sold to a farming family that had generations of goat experience on hand. 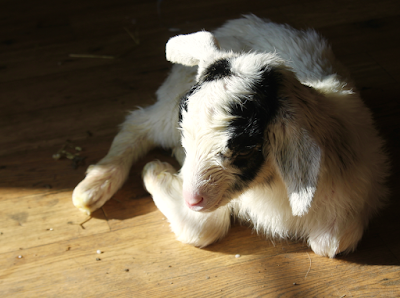 And so last night was the first night in a while without goat kids running around the farm house. It was so oddly quiet and calm. And then Bonita gave birth to this big boy, just moments ago. Here we are again!